This week I finally made it down to da Polpo, the latest outpost in Russell Norman’s ever-expanding fleet of New York-inspired, Venetian-style bàcari. I had a great time, and the food was good, but I’m not planning to post a review as I’m pretty sure you’ve heard it all before; thanks to the owner’s prolific presence on Twitter (@polpo), the opening of da Polpo a couple of months ago was one of the most talked about, tweeted and trending topics in the online foodie world. What I am going to post is a recipe. It’s not for meatballs or pizzette (if that’s what you’re craving, see my earlier post here) but it does involve pork. Salty, spicy, perfectly piggy pork. This recipe is a combination of flavours influenced by two of the highlights of our meal – golf-ball sized pork and fennel meatballs, doused in ever-so-slightly sweet tomato sauce, and pork shoulder pizza, rich and salty with the slight sharpness of pickled peppers. It’s a British interpretation of the Venetian tradition of little snacks or cicchetti; bite-sized mouthfuls of salty goodness to enjoy with a crisp, cold drink. Slightly less glamorous, perhaps, but every bit as delicious. I made these little beauties for a friend’s garden party this weekend. 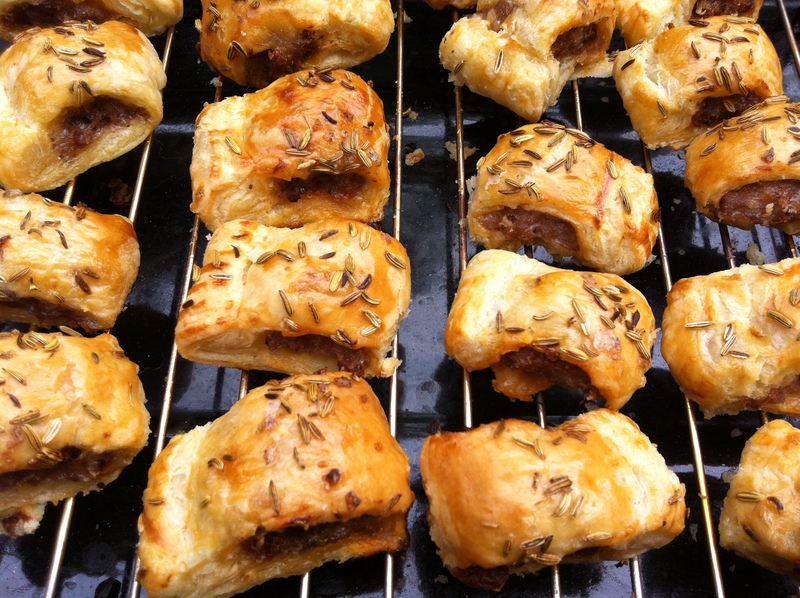 Her brief was to bring ‘party food’, and sausage rolls instantly sprung to mind. While a bad sausage roll is a truly terrible thing (anaemic clods of pastry wrapped round greasy grey meat), there’s little that beats the crisp, flaky, buttery goodness of the real deal, homemade and hot from the oven, eaten in quick succession as your mouth burns and your tastebuds sing. After recently discovering the joy of making homemade croissants, I decided to have a go at making my own pastry. I used a Delia Smith recipe which involves grating ice cold butter into flour and couldn’t be easier. However shop bought pastry is perfectly good, so if you can’t be bothered, simply skip straight to Step 2 below. The sausage meat is flavoured with dried chilli and hot smoked paprika for a spicy, ever-so-slightly sweet kick. I was planning to chop some pickled pepper flesh into the mix, but had a store cupboard fail, hence the chilli. One for next time perhaps. 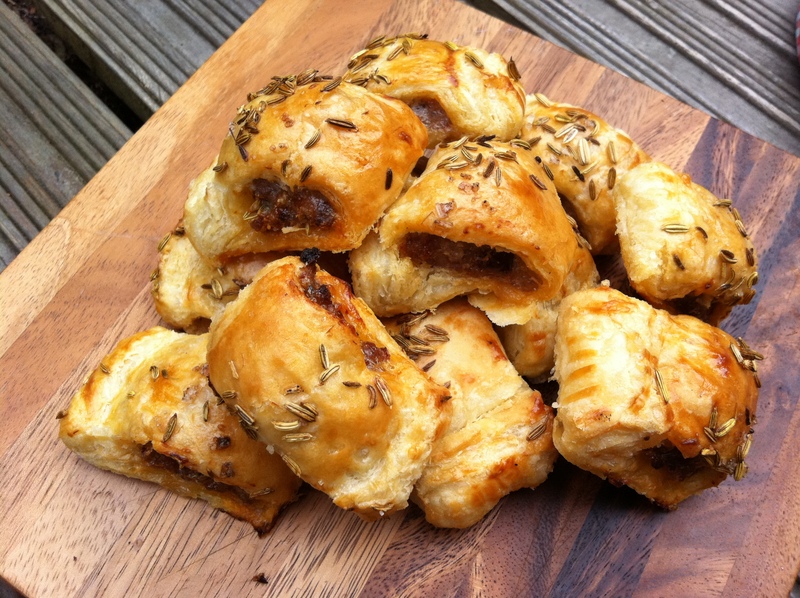 The chunky rolls are then sluiced in a milky egg wash, sprinkled with salt and fennel seeds and baked til golden and crispy. For a more classic variation, you could put a little mustard powder in the pastry, replace the chilli and paprika with rosemary, and top each little parcel with a single sage leaf, lightly oiled to make it crisp. The perfect party snack. Maybe even good enough to give those Venetians a run for their money. 1. The trick for perfect pastry is rock-hard cold butter, so an hour before you start work, pop the 175g butter into the freezer to harden. Sift together the flour and salt in a large bowl. Get your hard butter out the freezer and using a coarse cheese grater, grate it into the mixing bowl. Once the whole slab is grated, get a knife and mix the butter into the flour gently (don’t use your hands as this will warm the mixture) to produce a crumbly mixture. Add enough ice cold water to form a dough that leaves the bowl clean (careful, it shouldn’t be sticky), bringing it carefully together with your hands. Pop the dough in a black plastic bin liner and chill for 30 mins in the fridge. 2. When you’re ready to roll, mix together the sausage, chilli, paprika and pepper. Sprinkle your work surface with flour. Cut the pastry ball in half and roll into 2 strips approx. 40cm x 15cm each. Roll the sausage meat into 2 sausage shapes and place along the middle of each strip. Coat the pastry either side of the sausage with the egg mixture. Fold the pastry over and press down to seal then go over the seal with a fork for a pretty textured edge. 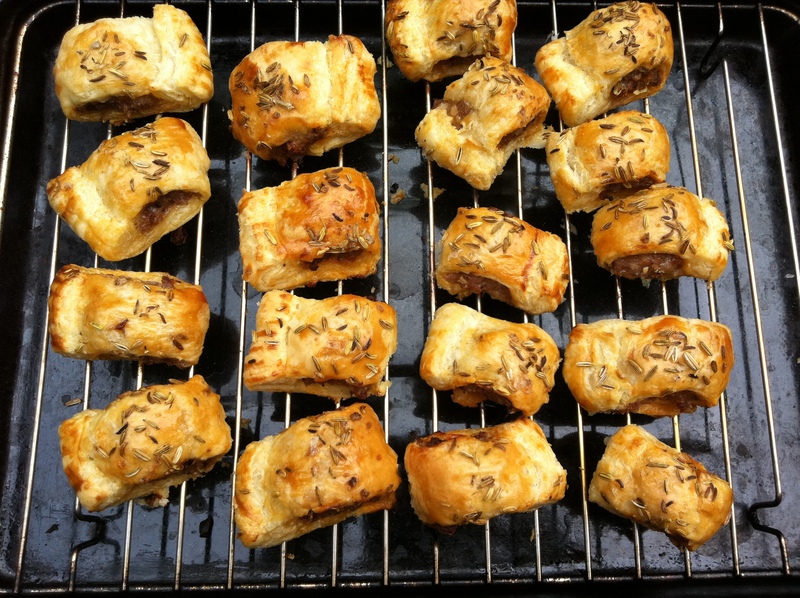 Brush the tops of the sausage rolls with egg wash, sprinkle with fennel seeds and sea salt. Cut into 5cm lengths and place on a non-stick baking sheet. Bake for 20 minutes, until risen, puffed and golden brown. 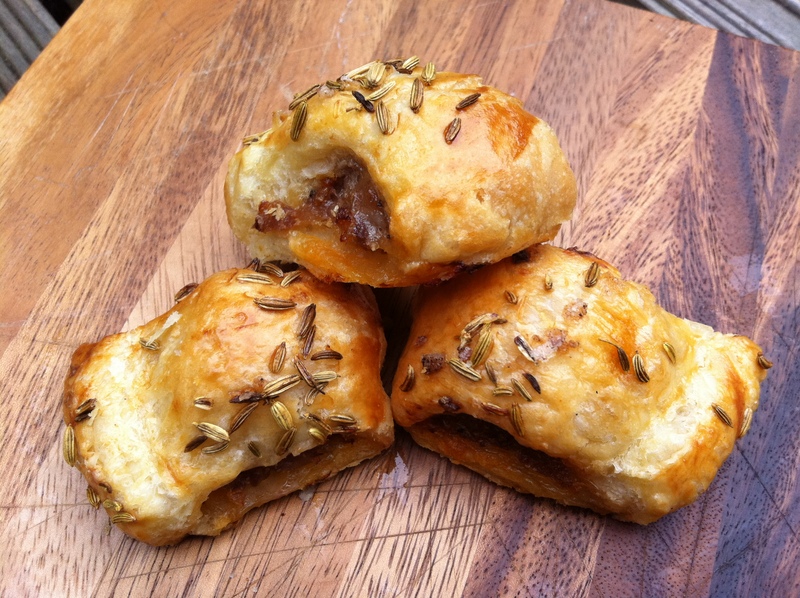 homemade sausage rolls are just the best! My gran makes some amazing ones! Oooh, I’m still a bit scared of pastry for things like this, but the Delia one sounds great. I might have a party this weekend just so I can make these. Of course, I’m only inviting myself so that I can gorge on salty pig and buttery pastry to my heart’s content because these look amazing. Oh my, these look gorgeous – and living in the land of Pork, it´s always good to find new inspiration! Frugal Feeding – they absolutely are. Would love to know your granny’s recipe! I’ll have to retrieve it from her. Oh, I love fennel with pork. And with paprika too? Winner. These look so delicious. Bookmarked to try ASAP! 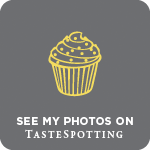 I found you while reading Nuts ABout Food – so glad I did! These look so yummy! Must try!